Should You Upgrade from Vista to Windows 7? So you finally got comfortable with Windows Vista, but now Windows 7 is on the horizon. Should you upgrade or stick with Vista? Let's explore the differences in the two Windows operating systems. When comparing Vista to Windows 7, the most important things to consider are performance, security, usability, compatibility issues. Many Vista users have experienced problems in these areas, and Windows 7 goes a long way to address and improve each one. Windows 7 should launch faster, since it has fewer start-up services and those will run in parallel. And once you've booted up, you should notice that Windows 7 just feels a lot faster than Vista. The main reason for this is improved memory management. In Windows XP and Vista, every application that's open ties up video memory, even when minimized. In Windows 7, only visible apps consume video memory. If you normally run with a bunch of programs active, you should notice better performance. I could definitely feel the difference on my 4-year-old Sony VAIO laptop. And speaking of laptops, you can expect improved battery life in Windows 7. It goes without saying that Windows 7 builds upon all the security improvements that have been rolled into XP and Vista, as exploits are discovered and patched on an ongoing basis. But there are also some new security features in Windows 7, most notably DirectAccess and BitLocker To Go. DirectAccess will be helpful to telecommuters, since it provides a seamless and secure connection to the office network. BitLocker To Go adds data encryption to USB flash drives and other removable storage devices. Windows Vista had a huge User Account Control (UAC) problem, making it annoying to install any program or change a setting. Microsoft has heard your cries, felt your pain, and has removed many of the annoying UAC prompts in Windows 7 UAC, making it quicker and easier to make system changes. You'll also find that the taskbar on Win 7 is greatly improved. Instead of those little icons on the bottom right corner of Vista, you can decide which ones you want displayed. You simply mouse over an icon to get a full screen preview that disappears when you move the mouse, and the icons can be rearranged by click and drag. Jump List is another new feature on the taskbar. Right clicking on a program that you used recently will show your most recent documents. For example, clicking on the Word icon will show Word documents. Another nifty plus is that you can put other files that you use often on the Jump List so that they are only a click or two away. Win7 also offers some nifty Mac-like features to move and resize open windows. Check out my companion article Windows 7 Desktop Customization to see how Aero Snap and Aero Shake work. Win 7 has included multi-touch for all supported hardware. If you like the kind of multi-finger screen and image manipulation you can do on the iPhone, you'll be happy to have those features in Windows 7. And in the fun category, Windows 7 comes with online Spades, Checkers and Backgammon. The media center will feature Internet TV with MSN channels as its default and a sidebar for control. Just add a USB TV tuner and you have an instant TiVo. HomeGroup is another feature new to Win7. Automatically set up when you run the first PC, you can add other computers to share files or peripherals. This means you can store photos on your main PC and view them with your laptop. View Available Network (VAN) allows one click access to available networks. Libraries will keep those photos, documents, and music organized as well. One of the biggest complaints about Vista was that hardware and other peripherals that worked fine with XP wouldn't work under Vista. Windows 7 includes a more up-to-date set of drivers, so it SHOULD automatically recognize your printer, scanner, external drives and other devices. To me it looks like a slam dunk. 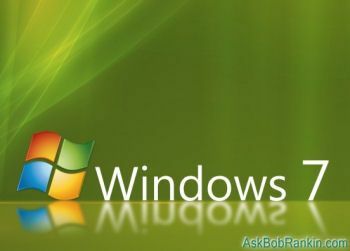 The word from most reviewers is that Windows 7 is going to be everything we hoped for in Vista. It looks good AND it runs good. Performance and security have been beefed up. Win7 runs faster, with less RAM, than Vista. The user interface sports a bunch of improvements that go beyond eye candy. You can actually get things done quicker with some of the new usability features. People are comparing the slick Win7 with Mac OS X. And it seems that the annoyances and nagging compatibility issues that made Vista a thorn in so many sides have been remedied. Am I saying you'd be a fool NOT to upgrade your Vista system to Windows 7? No. But there are plenty of advantages, and little downside to doing so. Except maybe, for the money... The Windows 7 Home Premium Upgrade goes for $119, but you will have the option to purchase a Windows 7 Family Pack, which allows you to install on 3 machines for $149. Oh, and if you purchase a computer with Vista now, you'll get a free upgrade to Windows 7 when it's released in late October. Most recent comments on "Upgrade Vista to Windows 7"
Windows ME is the greatest operating system of all time!!!! Windows millennium edition 4 ever YEAH!!!! Window 7 just isn't in the same league as "Windows ME"
Anything is an improvement over Vista ;D I have XP but heard it was just a jazzed up version of 2000/me or both??? EDITOR'S NOTE: With apologies to Bill Clinton, that depends on what was meant by "just" and "jazzed". Both XP and Win7 are huge leaps UP from Windows ME. For me the big question is whether I'll need to repurchase programs like Microsoft Office or Paint Shop Pro. We just purchased a new laptop; are we still able to get 7 free do you suppose? I'm a big Windows fan. Thank you for any advice, or suggestions. I went from XP 32 bit to XP 64 bit when I got a motherboard with a dual core processor. I had to leave behind a certain amount of hardware, and some programs still on my hard disk would run, but can't be reinstalled. When I wanted to upgrade to Vista, it turned out I couldn't "upgrade" because there was no "path" for a 64 bit to 64 bit upgrade. Right now I'm running both Vista 64 and Win 7 RC 64. Win 7 is smoother, but Office 2007 applications keep crashing. Apparently, Win 7 doesn't like some of my Outlook add-ins. I also had a problem upgrading to Win 7 in that it didn't have a driver for my SIIG sound card. I reinstalled the Vista driver, and that worked. I don't have a problem with UAC under Vista because I run it as an administrator. I know, that's a no-no. But I think it beats turning UAC off entirely. I think people are going to be very surprised if they want to upgrade to a 64 bit version of Win 7, since a lot of hardware won't work, but if they stick with the 32 bit version, the process should be easier. I just bought a new Dell laptop with 64 bit Vista Home Premium. Will I have a problem converting to Windows 7? OOOhhhh get a Mac. I switched a year ago, can't believe how much easier computer life is now compared to Windows. I knew most of the work arounds with windows xp, but I don't need any now, just figuring out which features I want to use. Nothing like having quality around. And no more fear of upgrades, no more "lets wait till next year so they can get their act together". If you have an older HP PC running Vista you can pre-order an upgrade to Windows 7 fro $50.00 from Amazon, Newegg, HP and a few others. I pre-ordered from Amazon and 7 will ship a few days after it is released. I opted for free shipping to keep the cost at $50. I've had it with Windows. Buy buy buy buy buy and make MS even richer, but still don't get any problems resolved. Windows 95 SE was cracking, stable, fast reliable, then thy changed it to the crud that was 97. Then Windows 2000 built on the NT core was even faster and more reliable yet with more features, but they forced the crud that was ME on people. Then eventually XP gets to SP 3 and is fast, reliable as you could wish for and has all the features you could want. Then they change it again to the crud that is Vista. It's a money making cycle and I for one have been looking at iMac's and Linux compatible machines. Really guys, Windows has had it's day and has only a short life left in it. Spend your money wisely on Linux or Mac. Bob you've a decent mag, think of getting out of Windows while you can. And what happens if after the "upgrade" from vista to 7 the OS goes bad (as is to be expected)? Does one then first do a fresh install of vista and then a "upgrade" since there is no way to do a fresh install of 7 with an upgrade license? I guess someone somewhere gets paid huge amounts to make life miserable for end consumers, i.e., lesser beings, like us? Where can we find the option to order Windows 7 Family Pack for $149 from Microsoft? Um, Gary, there wasn't either Windows 95 SE or Windows 97. There *was* a Windows 95 and Windows 98 SE. But Windows 98 SE was a ton better than Windows 95, a lot more stable and handled hardware a lot better. Windows Vista came out *before* Windows XP SP3. In fact, even Vista SP1 came out before that. So I'm not sure you know what you're talking about. I got an early release version of 7 from Microsoft. I think it smokes Vista completely. Its faster and much easier to use. When I upgraded from Vista, I started on a super-clean computer, and removed anti-virus, anti-spyware, firewall, and removed all but the last restore point. It took only 1 1/2 hours to upgrade. I then reinstalled the AV, etc. My games and printer that I had problems running with Vista work great now. So I think it's worth it. Thanks for a great newsletter, Bob! After using Microsoft DOS and Windows for more that twenty years, I got a MacBook in November 2007. The first six months of 2008 were hell and I bitterly regretted it, saying, 'The best thing about Apple is that the dual-core Macs can run Windows.' the Vista Business edition of which, in reaction to the culture shock of trying to migrate, I installed and used almost exclusively for several months. I spent the summer doing some Apple One-to-One session, which didn't really seem particularly useful at the time. I struggled away to adapt to Vista, having used XP until January 2008, and more or less did. Then the damn thing went wrong and got all screwed up, so I thought I'd reinstall it to fix it. Big mistake which turned out to be a godsend. Vista didn't reinstall properly (Surprise, surprise, surprise!) and it started to be more hassle to get it to work than it was to use OSX. Then a lot of the One-to-One sessions started to gel together and pay off. Eventually, about a year after trying to make the change, it suddenly became easier and felt more natural to work on a Mac. Now, when I use a Windows machine I'm amazed how I tortured myself with them for so long. They seem so primitive now. I haven't gone retro and fired up Vista on my MacBook for months now. The last several time I did, something always went wrong and I always ended up saying to and asking myself, 'Jeeez, they were always doing things like this. How the hell did I put up with it?!' This new Windows may look, and even be, more like OSX, but there's no way I'd go back to it. Do yourself a favour, however difficult it may seem for ever such a long time, get a Mac and stick with it. If you manage to master it, you'll never be able to entertain the thought of going back again Windows. Really! I searched the MS Win 7 pages, but could not locate mention of the "free" Vista upgrade to 7 for those who have just recently bought vista laptop. Any pointers? I upgraded from Vista to Windows 7 and cannot find my old emails. I am aware that I have to install a mail program, however I do not know in which folder to look for those old emails. Please help. I want to purchase Vista Home Starter to 7 Home Premium. Where should I purchase it?